Maryna is available for private one-on one consultations, energy coaching and energy balancing treatments for both adults and children. When there are chronic imbalances in the energetic field, physical and mental ailments begin to manifest. 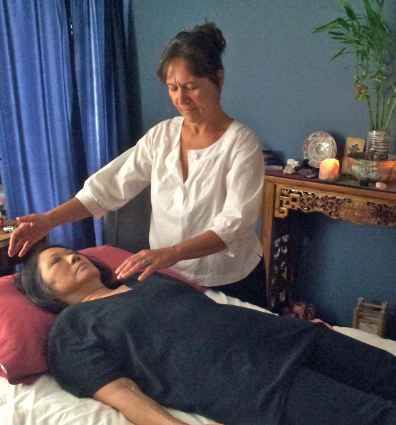 Eden Energy Medicine (EEM) is an energy healing system developed by world-renowned healer, teacher, and authority on energy medicine, Donna Eden. Donna has treated over 10,000 clients over 30 years and has written three books on the subject, one which is translated into 19 languages. She now travels globally and has certification programs in both the USA and the UK. Maryna Allan is one of 1200 certified EEM-CP practitioners and has trained directly with Donna and also worked as her assistant in Wales, UK in 2011. For more information on Donna Eden read here. EEM focuses on the body’s subtle energies to enhance a person’s health and well-being. Like many ancient healing traditions, Eden Energy Medicine recognizes that disturbances in a person’s energy field often precede illness and that balancing these subtle energies can assist the body in moving towards wellness. Whereas conventional medicine diagnoses and treats symptoms and diseases, Eden Energy Medicine assesses and corrects disturbances in the body’s energies and energy fields. 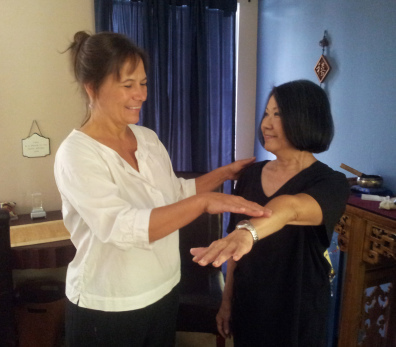 Much of EEM is based on the principals of Traditional Chinese Medicine as we work to balance and promote harmonious flow of energy in the meridians. Other systems in the body such as chakras, radiant circuits, electrics, celtic weave and the aura also have a direct affect on health and well-being and we focus on bringing these into balance as well.A private session generally lasts 1.5 hours. During this time we will briefly discuss your concerns and reasons for consultation to assist me in assessing potential energy imbalances in the subtle energy fields. 60 Minute sessions are also available (read choices below). We will begin a process where I assess the flow of energies in your body and facilitate corrections designed to bring disturbed energies back to a state of balance and harmony. I’ll use muscle-response testing as a method to assess your body’s energies, also known as energy kinesiology. After assessments we will follow with treatments which are done on a massage table fully clothed. I will use various forms of light and deeper touch, along with movement of my hands within your energy fields, to balance and harmonize your energies. I will also recommend and teach specific exercises and movements that you can do to help balance your energies yourself. Some of the techniques are extremely effective in calming the nervous system and promoting deep relaxation, and clients may experience a deepened state or fall asleep. You may find yourself drifting off pleasantly yet be fully aware of your surroundings. Often clients feel a significant shift after their energies have been balanced, which may include an improvement in their overall physical energy and/or feeling more optimistic, balanced, and peaceful. Effective energy work requires a partnership between EEM practitioner and client. Achieving body/mind well-being is the responsibility of both the client and the practitioner. I will help you develop new energy habits to substitute for less useful ones. Your role in this partnership is to make a strong commitment to work to achieve the goal of energy balance. This includes doing homework between sessions and the regular practice of energy exercises that I recommend for specific energetic results. Who might benefit from an energy session? Should I use Eden Energy Medicine instead of using a medical doctor? Answer: Energy Medicine should not necessarily be used as a substitute for traditional alleopathic medicine. However, the two approaches are not mutually exclusive and in fact are complementary. Energy Medicine seeks to address the cause of an issue energetically, not mask the symptom with drugs or prescriptions. Energy Medicine is not invasive but uses the body’s own energies to heal itself. Often Western medicine utilizes invasive procedures to attempt to heal the body. Energy Medicine can give you tools to calm the ‘fight flight’ response and deal with the stress associated with prolonged illness and traditional medical treatment such as chemotherapy. Some techniques (like the Brazilian Toe Reflexology technique) can even eliminate or greatly reduce the negative effects of Chemo or Radiation. Energy Medicine seeks to promote self-care and self-healing as the foundation of our energies, enabling the body to find its inner doctor to assist in finding optimum health, believing that our body wants to heal itself and be whole. Conversely, often allopathic medicine is based on giving your care over to a doctor to tell you what is wrong or what should be done without including you in the process of your own care. Energy Medicine seeks to educate, with knowledge and specific protocols or techniques, enabling empowerment of the individual as an active participant and partner in establishing healthy living and well-being. Energy Medicine and allopathic medicine can partner nicely. For example, if one must have surgery, getting one’s energies primed and balanced before, after and during surgery will facilitate faster healing and recovery. 1) Assemblage Point: To mend a broken heart after suffering a personal loss The Assemblage Point Re-alignment can help in the healing process after divorce, passing of a loved-one, or loss of identity, job, home or other trauma where one feels ‘out at sea’. 2. Electrical System Re-balancing— The electrics are an energy that seems to emerge from the electrical dimension of the other energy systems. They are not an independent energy system like the meridians, chakras, or aura, but they are rather intimately related to all the major energy systems: separate from each but also an aspect of each, something like the way liquid is separate from yet part of each of your organs. The electrics serve as a bridge that connects all the energy systems at the basic level of the body’s electricity. I usually have no idea what will occur when I first hold a person’s electric points. The energy goes where it is needed. There are reports of scar tissue being healed during an electrics session, heart ataxia eliminated, a knee replacement operation avoided, and all manner of emotional trauma overcome. But most important, in terms of whole-body healing, is the way the electrics connect all the systems. If energy fields such as the aura and chakra align the organs and other energies by surrounding them, the electrics move right through them, connecting and coordinating them at the tangible dimension of their electrical nature.3. 3. Chakra Balancing— The word chakra translates from the Sanskrit as disk, vortex, or wheel. The chakras are concentrated centers of energy. Each major chakra in the human body is a center of swirling energy positioned at one of seven points, from the base of your spine to the top of your head. Where the meridians deliver their energy to the organs, the chakras bathe the organs in their energies.Energy testing is used to determine if some or all of the chakras are blocked or unbalanced. Each chakra supplies energy to specific organs, corresponds to a distinct aspect of your personality, and resonates (respectively, from the bottom to the top chakra) with one of seven universal principles having to do with survival, creativity, identity, love, expression, comprehension, or transcendence. Your chakras also code your experiences in their energies, just as memories are chemically coded in your neurons. An imprint of every emotionally significant event you have experienced is believed to be recorded in your chakra energies. A sensitive practitioner’s hand held over a chakra may resonate with pain in a related organ, congestion in a lymph node, subtle abnormalities in heat or pulsing, areas of emotional turmoil, or even tune into a stored memory that might be addressed as part of the healing process. 4) The Meridians: In the way an artery carries blood, a meridian carries energy. As the body’s energy bloodstream, the meridian system brings vitality and balance, removes blockages, adjusts metabolism, and even determines the speed and form of cellular change. The flow of the meridian energy pathways is as critical as the flow of blood. No energy, no life. Meridians affect every organ and every physiological system, including the immune, nervous, endocrine, circulatory, respiratory, digestive, skeletal, muscular, and lymphatic systems. Each system is fed by at least one meridian. If a meridian’s energy is obstructed or unregulated, the system it feeds is jeopardized. The meridians include fourteen tangible channels that carry energy into, through, and out of your body. Your meridian pathways also connect hundreds of tiny, distinct reservoirs of heat and electromagnetic energy along the surface of the skin. These are your acupuncture points, and they can be stimulated with needles or physical pressure to release or redistribute energy along the meridian pathway. 5) The Aura: Your aura is a multi-layered shell of energy that emanates from your body and interacts with the energies of your environment. It is itself a protective atmosphere that surrounds you, filtering out many of the energies you encounter and drawing in others that you need. Like a space suit, your aura protects you from harmful energies. Like a radio antenna, it brings in energies with which it resonates. The aura is a conduit, a two-way antenna that brings in energy from the environment to your chakras and that sends energy from your chakras outward. When you feel happy, attractive, and spirited, your aura may fill an entire room. When you are sad, despondent, and somber, your aura crashes in on you, forming an energetic shell that isolates you from the world. Some people’s auras characteristically reach out and embrace you. Others keep you out like an electric fence. A study conducted by Valerie Hunt, a neurophysiologist at UCLA’s Energy Fields Laboratory, compared “aura readings” with neurophysiological measures. The auras seen by eight practitioners not only corresponded with one another, they correlated with wave patterns picked up by electrodes on the skin at the spot that was being observed. 6) The Celtic Weave: The body’s energies spin, spiral, curve, twist, crisscross, and weave themselves into patterns of magnificent beauty. The equilibrium of this kaleidoscope of colors and shapes is maintained by an energy system known by different names to energy healers throughout the world. In the East, it has been called the “Tibetan energy ring.” In yoga tradition, it is represented by two curved lines that cross seven times, symbolically encasing the seven chakras. In the West, it is seen in the caduceus, the intertwined serpents ­also crossing seven times­ found on the staff that is the symbol of the medical profession. Donna uses the term Celtic weave not only because she has a personal affinity with Celtic healing, but also because the pattern looks to her like the old Celtic drawings of a spiraling, sideways infinity sign, never beginning and never ending and sometimes forming a triple spiral. Like an invisible thread that keeps all the energy systems functioning as a single unit, the Celtic weave networks throughout and around the body in spiraling figure-eight patterns. The double helix of DNA is this pattern in microcosm. The left hemisphere’s control of the right side of the body and the right hemisphere’s control of the left side is this pattern writ large. 7) The Five Rhythms: Your meridians, chakras, aura, and other essential energies are influenced by a more pervasive energy system. Donna does not see it as a separate energy but rather as a rhythm that runs through all the others, leaving its vibratory imprint on physical attributes, health patterns, and personality traits. Mapped long ago in traditional Chinese medicine, all of life was categorized into five “elements,” “movements,” or “seasons” (there is no perfect translation; ­all three terms have been used, suggesting qualities of being both cyclical and substantial). These energies were considered the building blocks of the universe, providing a basis for understanding how the world works, how societies organize themselves, and what the human body needs to maintain health. Metaphors for describing these five distinct rhythms have drawn from concrete, observable elements of nature (water, wood, fire, earth, and metal) and from the seasons (winter, spring, summer, Indian summer, and autumn). Like the background music during a movie, the person’s primary rhythm, in combination with the changing rhythms of life’s seasons, directs the tone and mood of the entire energy system and sets the atmosphere of the life being lived. 8) Triple Warmer (Fight Flight): Triple warmer is the meridian that networks the energies of the immune system to attack an invader, and it mobilizes the body’s energies in an emergency for the fight-or-flight-or-freeze response. In carrying out these critical functions, it operates in ways that are so beyond the range of any other meridian that some consider it a system unto itself. Its energies work in conjunction with the hypothalamus gland, which is the body’s thermostat. The hypothalamus is also the instigator of the body’s emergency response. Like an army, triple warmer mobilizes during threat or perceived threat, coordinating all the other energy systems to activate the immune response, govern the fight/flight/freeze mechanism, and establish and maintain habitual responses to threat. 10) Radiant Circuits: The radiant circuits function to ensure that all the other energy systems are working for the common good. They redistribute energies to where they are most needed, responding to any health challenge the body might encounter. In terms of evolution, the radiant circuits have been around longer than the meridians. Primitive organisms such as insects move their energies via the radiant circuits rather than through a meridian system, and the radiant circuits can be seen in the embryo before the meridians develop. As in the way that riverbeds are formed, it is as if radiant energies that habitually followed the same course became meridians. Where the meridians are tied to fixed pathways and specific organs, the radiant energies operate as fluid fields, embodying a distinct spontaneous intelligence. Like hyperlinks on a website, they jump instantly to wherever they are needed, bringing revitalization, joy, and spiritual connection. If triple warmer mobilizes your inner militia, the radiant circuits mobilize your inner mom, showering you with healing energy, providing life-sustaining resources, and lifting your morale.